Anyone who knows my husband knows he avoids building or repairing things if he can. However with Aaron's room I must brag on him. He has put together the rocking chair and ottoman. He also built this closet organizer/storage area. We ended up with as much hanging space as we started and we now have shelving for toys and clothes and sheets. My husband did this and I am proud of him. 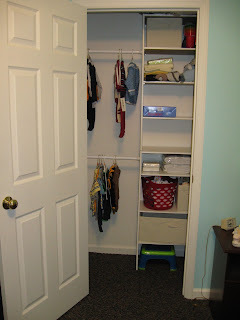 We also learned that our closet is only 4 feet wide which they tell us is unusual. I guess most are 5 feet or larger but we were able to make this work with some pressure rods. Less holes in the wall and adjustable. I like it. dont you just love building the room! when we did anthony's it was so exciting like he actually was going to exist in our arms soon! the only draw back was once the room was finished i wanted him to hurry up and be born so i could show him his room! thats very exciting and perry we are proud of you too! way to go Perry! Cute things!